Abhaneri, located at a distance of 95 km from Jaipur on Jaipur-Agra Road, is a village in the Dausa district of Rajasthan. 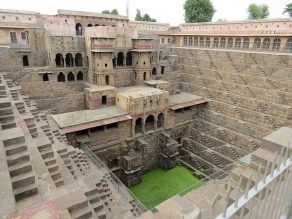 The place is widely popular as it is home to a colossal stepwell, Chand Baori, which is considered among the most beautiful stepwells of India. The village of Abhaneri is believed to have been established by Samrat Mihir Bhoj who was a Gurjar Pratihar king. The village was originally named Abha Nagri, which means the “city of brightness”; however, with time, due to mispronunciation of the term, it has changed to Abhaneri. The city of brightness or Abha Nagri, as it was once called, is in a dilapidated condition today; nevertheless, this small hamlet attracts a large number of tourists from all over the world. Abhaneri is famous for baoris which were used for harvesting rainwater for summers. Of all the stepwells present here, Chand Baori is the most famous and is widely known for its beautiful stone architecture. It is one of India's largest and deepest stepwells. Harshat Mata Temple is a popular tourist attraction that boasts of the amazing architectural splendour of medieval India. The temple is dedicated to Harshat Mata who is considered to be the goddess of joy and happiness. The village of Abhaneri is also known for various Rajasthani folk dances which include Ghoomar, Kalbeliya and Bhavai. Ghoomar is a dance of the Bhil tribe while Kalbelia is a dance performed by the women of Kalbelia tribe, who make their living by catching snakes and selling their venom. On the other hand, Bhavai is a dance performed as a ritual before Amba Mata or Mother Earth. The village being located merely at a distance of 95 km from Jaipur is easily accessible from all parts of India. Owing to its glorious past and colourful culture, a large number of tourists from all over the world are attracted to its threshold. The best time to visit Abhaneri is between October and March as the weather remains relatively pleasant and comfortable during this period. Being located on the National Highway 11 connecting Agra and Jaipur, Abhaneri is easily accessible by road. Dausa Railway Station is located about 35 kms from Abhaneri. Jaipur Railway Station is located at a distance of 95 kms from Abhaneri. Trains to all the major cities of India are available from Jaipur. Sanganer Airport, located at Jaipur, at a distance of 95 kms is the nearest airport to Abhaneri. Taxis can be hired from the airport to reach Abhaneri. The airport is connected to Indira Gandhi International Airport, New Delhi and Chhatrapati Shivaji International Airport, Mumbai by regular flights. PC: Mukamian98 Aren't you always curious to visit a new place each time there is a holiday? That inner surge which comes from within to explore travel destinations along with friends and family with excitement touching the highest peak is irreplaceable.